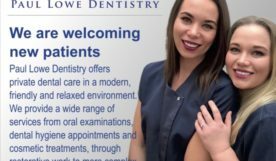 Here at Paul Lowe Dentistry in Solihull we believe that everyone should enjoy excellent oral health. We want you to experience the remarkable benefits to health and well-being that first class dental care can deliver. We also want you to enjoy a welcoming environment which combines friendly, personal service with the professional expertise of a highly accomplished dental practice.